Due to high processing speeds and increasing power losses in electronic devices thermal problems have a significant participation in the event of a system failure. Therefore heat dissipation in the environment of a thermal management is an important aspect. A heatsink is a mechanical part which is connected to an electronic device which produces heat thermally conductive. It is destined and designed for dissipating heat from a device. 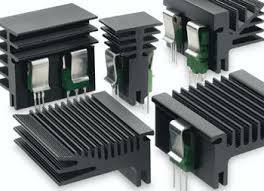 Heatsinks, also called cooling profiles or cooling plates are in its original, classic form so-called extruded profiles, which means that the profile is made of a special, good thermal conductive aluminum whose metal parts are made in the extrusion process.